Let me show you how to get the most out of your stamping investment. In this class, you will create four unique all-occasion cards and matching gift box. You will use one all purpose greeting stamp set, an artistic stamp set, some ribbon and a few techniques. 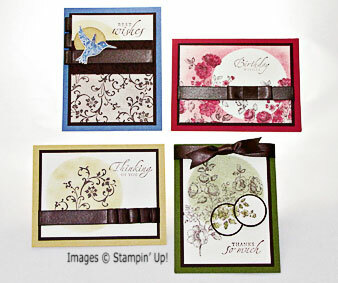 I’ll show you how to make your cards go from wonderful to ‘WOW’ using a few essential supplies. I’ll also show you how you can take the same card design and use it for a formal occasion such as a wedding or baby shower. 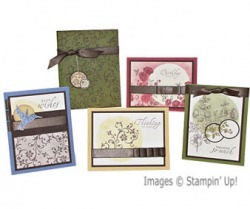 If you love stamping, you are not going to want to miss this class. Register By: 1 week before class using form below. Class Fee: $25/person or 2 for $40, demonstrators get a $5 discount. Bring a friend, you each save $5 -- See option below. Bring a friend and you each SAVE $5!